MULTIPLE OFFERS H&B DUE 3-18-2019 3PM. 4 BEDROOM, 1.5 BATHS, 1350 SFT. COMPLETELY UPDATED IN 2017. ALL NEW WINDOWS AND SIDING. KITCHEN HAS GRANITE COUNTER TOPS, GLASS TILE BACK SPLASH SURROUNDED BY ALL NEW WHITE SHAKE CABINETS WITH DEEP UNDERMOUNT STAINLESS STEEL SINK. 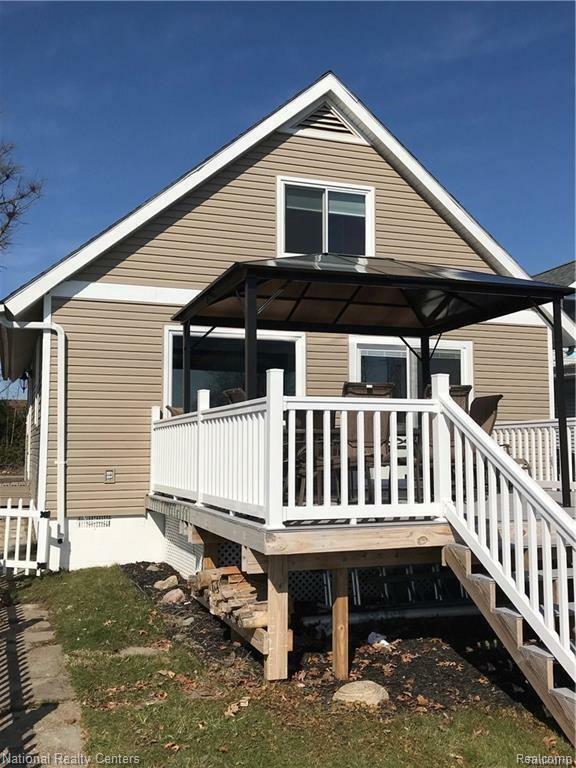 FULL MAIN FLOOR BATH HAS CUSTOM TILE SHOWER WITH GLASS SHOWER DOORS, UPSTAIRS HALF BATH HAS CERAMIC TILE FLOOR FLOORING AND VANITY WITH GRANITE TOP. ALL NEW FLOORING THROUGHOUT THE ENTIRE HOUSE. ALL NEW APPLIANCES PLUS WASHER AND DRYER IN NEW LAUNDRY ROOM. NEW WATER SOFTENER IN 2018. OUTSIDE YOUR BACK YARD IS BEAUTIFUL ALL SPORTS ROUND LAKE. GREAT VIEWS OF THE LAKE FROM YOUR 16X16 TREK DECK. THIS HOME COMES COMPLETELY FURNISHED, RIGHT DOWN TO THE BBQ. SLEEP 10 COMFORTABLY. HOME IS COMPLETE WITH A 9X10 GAZEBO WHEN YOU NEED A BREAK FROM THE SUN. ALL YOU NEED TO BRING IS YOUR BATHING SUIT AND SUNSCREEN! WHAT STAYS: ALL APPLS, GAZEBO, PATIO SET, FIREPIT, GAS BBQ, 50' DOCK, FURNITURE, LINENS AND KITCHEN WARE. MUST SEE! IDX provided courtesy of Realcomp II Ltd., via National Realty Centers-Northville and Realcomp, ©2019 Realcomp II Ltd. Shareholders. Copyright 2019 Realcomp II Ltd. Shareholders. Real estate listings held by brokerages other than The Alex Nugent Team | Real Estate One are marked with the Realcomp-approved IDX logo and are provided through IDX through Realcomp II Ltd. IDX information is provided exclusively for the consumers' personal, non-commercial use and may not be used for any purpose other than to identify prospective properties consumers may be interested in purchasing. Any use of search facilities of data on the site, other than by a consumer looking to purchase real estate, is prohibited. The accuracy of all information, regardless of source, is not guaranteed or warranted. All information should be independently verified. Data last updated: 2019-04-19T20:56:40.167.